Are you looking for the free quilt pattern for the Fussy Cut Frames Pattern? Click Here to download this free quilt pattern! Quilty Box is an awesome monthly subscription service that delivers quilting fabric, tools, patterns, and supplies to your door every month. The goodies inside are always a wonderful surprise, and I love challenging myself to design a new quilt pattern with each month's materials. This month's box was curated by my quilting friend Stephanie Palmer, who you may know as the Late Night Quilter. She's also the creator of the Quilter's Planner, and if you got this month's box then you got a copy of the Quilter's Planner Mini! Click Here to check out the full size Quilter's Planner. 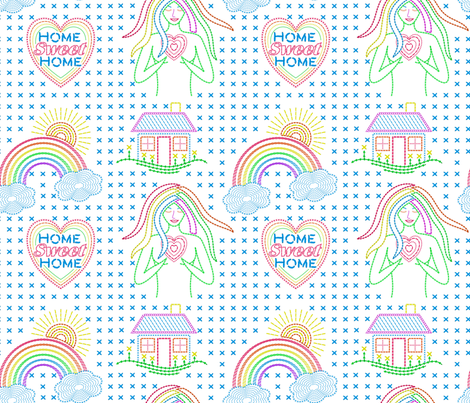 This month I used the Home Sweet Home Fabric that I designed for Spoonflower.com. This fabric matched perfectly with the Kona Roll Up in this month's Qulty Box! If you'd like to make this project too, make sure to have your fabric printed on 1 yard of the Kona Cotton Ultra for the best results. Click Here to find this fabric. Fussy cutting can definitely be fussy, but it's also a great way to showcase your favorite parts of a particular fabric. Don't skip the step of planning your cuts and drawing squares around your favorite designs. This is the best way to use fabric wisely and ensure you cut the greatest number of blocks from the yardage. I ended up cutting all 16 designs from 1 yard of fabric! Piecing the fussy cut blocks is very easy because we're intentionally cutting the strips long, then trimming up the edges square. Just be sure your ruler doesn't slip as you trim your blocks square. I needed a new batch of table napkins this month so I turned seven of the quilt blocks into napkins using the pillow case binding technique. Just sew all around the edge leaving a little opening on one side so you can turn the napkin right side out. This ensures all the raw edges and seam allowances are tucked inside and once you stitch around the outer edge, you'll have a very sturdy table napkin that will last for years. I added a bit of extra decorative stitching on my napkins to hold the layers together. This is totally optional, but I have noticed it seems to make them less wrinkly after a trip through the wash.
After making 7 table napkins, I still had 9 quilt blocks left over so I decided to also piece a small quilt top. This came together super simply - just piece the blocks together in sets of 3 and then piece the rows together to create your quilt top. If you wanted a larger quilt and no napkins you could simply piece ALL sixteen blocks together in four rows of four blocks to make a 48 inch quilt. Don't you just love having multiple options? I hope this inspires you to try fussy cutting this month and frame your favorite fabric designs so you can enjoy them either at your dining table or as a cute quilt top. Make sure to subscribe to Quilty Box so you can follow along and create fun new projects with me every month!